Reading begins in the home. Children acquire knowledge before coming to school that lays the foundation for reading. The single most important activity for building the knowledge required for reading is reading aloud to children. in Growing Without Schooling Issue 45, archived here. 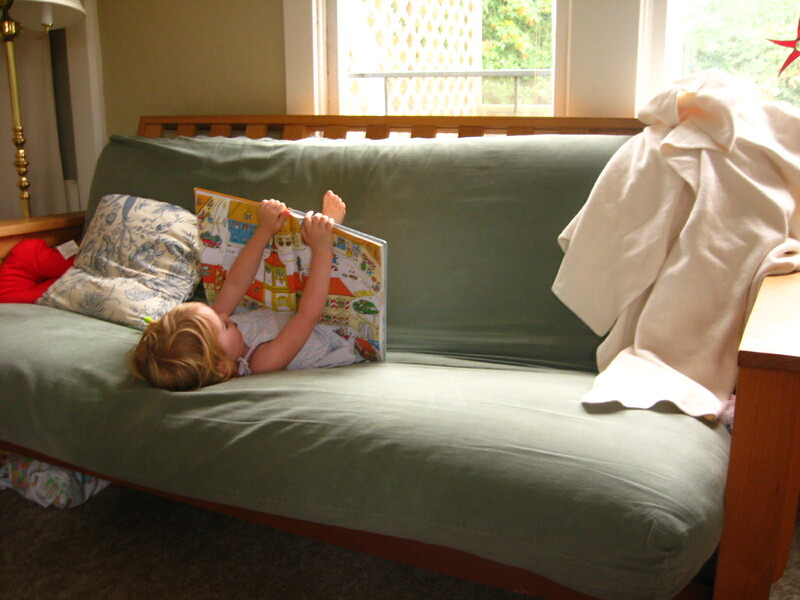 Our new reader (pictured above 5 years ago!) is enjoying listening to books on tape and reading along with the text in hand. She has been doing this with D’Aulaires Book of Greek Myths and Anne of Avonlea. More good quotes can be found over at Wednesday With Words at Dawn’s place. Yes! Reading and loving books begins with reading and loving books. Beautiful. We loved Richard Scarry here too. I gave a copy to my nephew for his 1st birthday and he could barely carry it, but it is his favorite to bring someone to read for him. D’Aulaires Greek Myths was such a great starting point for my readers and really got them excited about myths—enough so that we’ve read the Roman, Egyptian, and Norse myths. We actually started with the Norse myths + are circling back to the Greeks. I love this recording–Matthew Broderick!